She’s a 7-year-old whose eyes dance, whose arms and legs dance and who is always in motion because that is the nature of joy overflowing. And then her daddy started to travel for work. Not a lot, just a few days every few weeks. She grew quiet. The color drained out of her face and she got this sad, faraway look. Her eyes stopped dancing and she quit singing. Oh, to be a father so deeply loved. They told her crying wouldn’t help. She cried anyway. One day she cried for two hours. He got her a special nightshirt to sleep in when he’s gone. She still cried. He called or Facetimed with her every day when he was gone, but her eyes still didn’t dance and she still didn’t sing. Then one day I asked her momma to hem something for me. It was only fair, since her momma had possession of my sewing machine. She watched her mother at the machine and announced she wanted to learn to sew. She began sewing straight lines on fabric scraps. Then she sewed the scraps together and made patterns. Her mother found a child’s sewing machine safe for her to sew on by herself. She was off. The crying began to ebb. She asked if I knew how to make an apron. I spread tissue paper on the floor the same way a great-aunt had done for me years ago and had her lie down on it. Then I traced her and showed her how to pin the pattern and cut the fabric. She took it home, stitched the edges down, sewed on ribbon ties and added a pocket. The color came back to her cheeks. The last time her daddy was gone, she sewed a skirt for her little sister. It’s so tight her little sister can’t walk when she has it on, but they’re both proud of it. When I left home and moved 2,000 miles away, my mother embroidered a coverlet with beautiful red roses and then quilted it by hand one stitch at a time. When I had my first two babies and was still far from home, I hooked a rug. I’d never made a rug. I worked on it at night when the babies were asleep and my husband worked evenings. It’s funny how your hands can take your mind off your heart, how doing something for someone else is always a good elixir. The young seamstress is working on a Paris pillowcase. It’s pink fabric printed with the Eiffel Tower. Her dad is out of town again, but she’s so busy she hardly notices. Her little sewing machine is humming and so is she. I am missing wit today. Not mine—that train left the station long ago—but the wit of others. I miss hearing friendly banter, lively repartee and the clever twist of a phrase. There’s a playfulness to conversation that is slowly disappearing. But then conversation itself is disappearing. There is a growing brevity to our conversations today. They tend to be condensed. Telegraphic. We’re all in a hurry multi-tasking. It’s not easy doing six things at once and none of them well. It’s nearly an imposition to ask for someone’s time and presence. Plus, who needs a face-to-face when you’ve probably already covered the nuts and bolts of what you needed to say in an email, Facebook message or text. Or an emoji. Or a combination thereof. 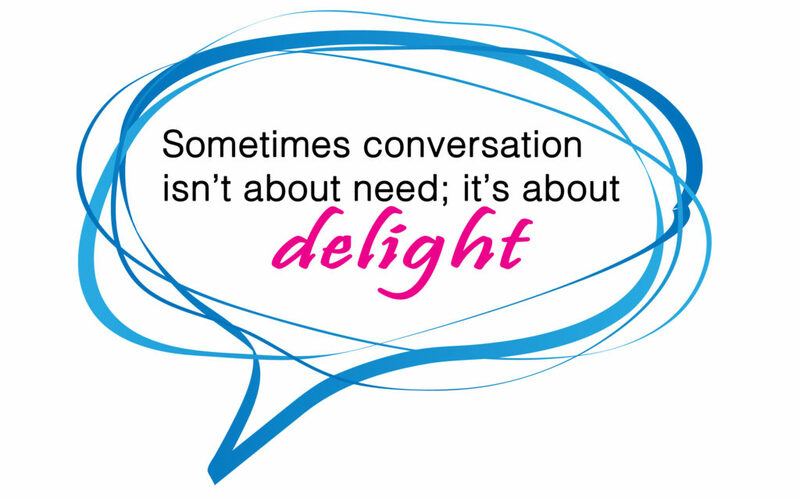 But conversation isn’t always about need; sometimes it’s about delight. As we were led to our seats at a restaurant, we passed an alcove with low lights, beautiful décor and four different couples seated at tables for two. Three of the four couples were radiant—basking in the glow of their cell phones. The fourth couple weren’t on electronic devices but looked as dull and glazed over as the couples on their cells. Maybe they were lamenting having left their phones at home. I’ve never understood why people make plans with other people, clean up, drive to a mutually-agreed-upon place and then ignore present company while they interact with others in cyberspace? There was a day a woman would have walked out on a man for asking her to dinner, then spending the evening ignoring her and talking to someone else. Does anyone ever talk to the child? Or does the child simply move from one screen to another all day? In some corners, even conversing with one’s child has gone from a pleasure to a duty. I grew up in a family of talkers, as did the husband. Both sets of parents often had friends over for the evening, to have dinner, play cards or simply sit outside on a warm night with a cool drink and talk. They talked and laughed, and teased and talked, and talked some more, voices drifting down the hallway or through open windows hours after we’d been sent to bed for the night. We do. But not as often as we once did. I recently discovered an online calculator that can predict snow days. There’s a catch to the Snow Day calculator—to get results you must enter your zip code and what type of school you attend. It only works for kids. There are no snow days for grown-ups. So go warm up the car and drag out the ice melt. Our son who lives in Chicago says he instinctively knows when it snows at night and can’t sleep anticipating daybreak. He’s an 8-year-old kid trapped in the body of a 36 year-old man. The snow they’ve been sounding alarms here for days has finally arrived. Frankly, it isn’t looking all that great. Not that I’ve had my nose pressed against the window monitoring it. Well, maybe a little. The snow is granular—like dishwasher detergent before it came in pods. You can barely call it a snowfall. It’s more like a snow sputter. It’s been coming down for several hours and is barely covering the grass, just nestling in between the blades. You can’t help but wonder if there is a heavier snowfall happening somewhere else. The snow is always deeper on the other side of the fence. One of the grands calls to say snow has covered the ground at her house. Her mother can be heard in the background saying snow has not covered the ground. “But it will,” says the voice on the other end, brimming with hope. Flakes that look like dishwasher detergent now mingle with larger flakes looking like cotton balls. Not fresh, fluffy cotton balls, but teased out, scraggly looking cotton-balls. This is what the hype was about? Ratty-looking cotton balls mixed with dishwasher detergent? A while later there is a commotion outside. Snow is falling at an angle and birds are flocking to the feeder. 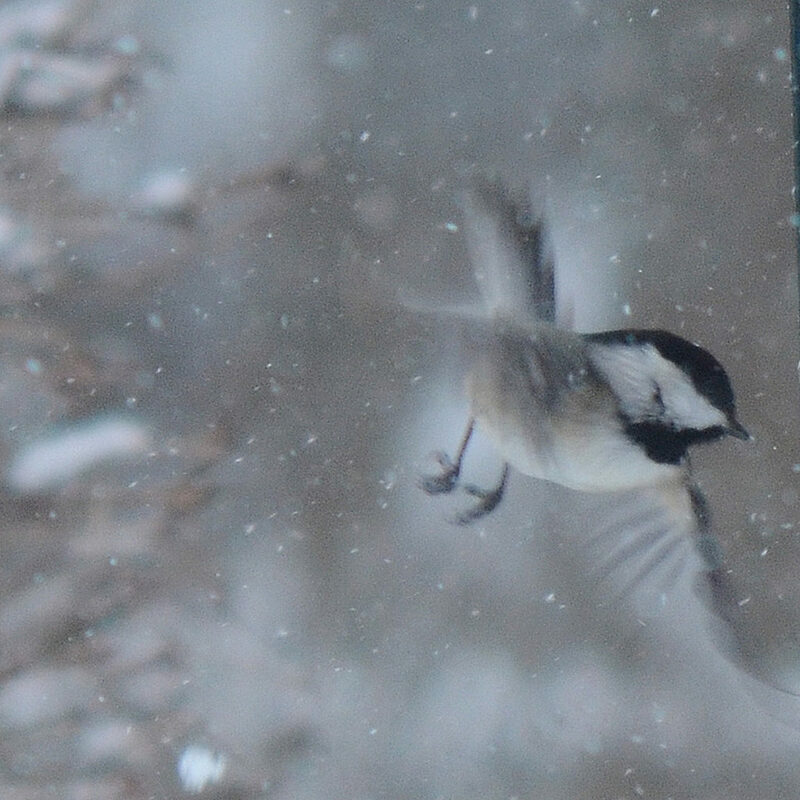 I grab a camera and freeze a chickadee on takeoff. A bird in flight is an amazing wonder of beauty and engineering. The feet propel the launch, then the bird draws them in tight. Wings spread in graceful arcs and the bird’s beak, cresting the smooth curves of the dome-shaped head, slices through the air. Birds land and depart and jostle one another around the feeder. It’s as frenetic as LaGuardia or Atlanta. Snow is picking up and more uniform now. There is no swirling or spinning, just a fine sawdust cascading from a craftsman’s workbench. By late afternoon, every inch of ground, every tree, car, mailbox and roof-top, have been layered with a blanket of down. Daylight fades and the snow takes on a beautiful cast of blue. The blue grows deeper, darker and richer, culminating in a breathtaking sapphire before fading into night. Maybe snow days aren’t just for kids after all. Dance class started today. No, not for us. We did that once—worst money ever spent. Sorry, Arthur Murray. It wasn’t you; it was us. We lasted for one fox trot and half a waltz before we two-stepped right out the door. Two of the little ones, cousins, have enrolled in dance class. We’re hoping they last longer than we did. There’s nothing like low-to-the-ground, full-bodied toddlers swathed in bubbles of pink netting attempting to master the willowy bends and arcs of professional ballerinas. There’s a buzz in the hallway before class. The teacher emerges from the classroom and introduces herself to each of the girls. Then come the good-byes, big hugs and lingering embraces. It will be a long journey for the little ones—approximately 10 steps around the corner and into the dance studio. Parents are not allowed in the studio, but can watch on a monitor in a waiting area. It appears the teacher’s goal today is to get eight preschoolers to stand in a straight line. The teacher explains something to the group, then patiently goes down the line, on her knees on hardwood, and puts eight pieces of tape on the floor, instructing each girl to stand on the tape. The teacher then goes down the line a second time, again positioning each dancer on her tape mark. Dancer No. 1, Dancer No. 2, Dancer No. 3, all the way to Dancer No. 8. All eight are on their tape marks. Tiny dancers then sit on the floor and bend to touch their toes. Those with long arms are at an advantage. Dance Class Lesson No. 1: All arms are not created equal and life is not fair. Dancers advance to standing position, attempt to point their feet and lift their arms overhead. The teacher then demonstrates how to skip. She motions for the girls to skip in a line. There is no line. Dancers are moving in every direction, crisscrossing, zig zagging and roaming in loose figure 8s. The girls are not grasping the concept of following one another. Girls are instructed to go to their backpacks and put on tap shoes. One returns with sunglasses. Another removes her tutu in order to put on tap shoes. She tugs at her leotard and tights but apparently decides to leave them on. They commence tapping their toes when the teacher turns to a little girl, picks her up and carries her to the camera. Did she want to wave to her mother? No. The teacher indicates the girl needs to go potty. Another dancer lines up behind the first dancer. The teacher indicates that this girl, too, needs to go potty. Then another dancer lines up. And another and another. They can do something in succession! Line up for the potty! Three little dancers remain on the dance floor. Not a single one is on her tape mark. Our youngest just texted that her root canal was over and that she fell asleep in the dental chair. I wasn’t surprised. It’s a family tradition. When our children were very young and exhausting (I was exhausted, not them), I once went to a dentist for a cleaning and fell sound asleep in the chair. The dentist had to shake my arm to wake me. It was the longest stretch of uninterrupted sleep I’d had in months. I asked if I could come back for another cleaning the next day, but he said no. I’ve always wondered if dentists are offended when patients fall asleep in the chair. I’m one of those people who become very eye conscious when I go to the dentist. Are you supposed to keep your eyes open or your eyes closed? It’s like those awkward moments when you don’t know what to do with your arms and hands. 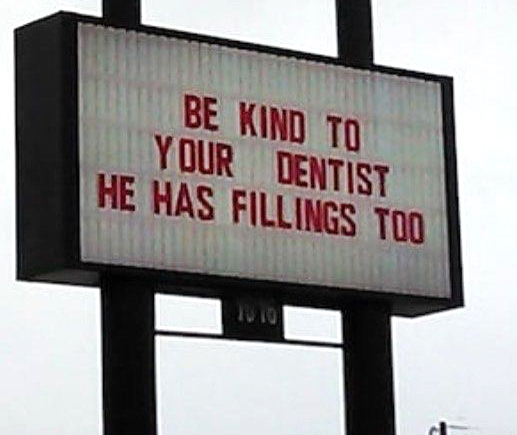 I was at the dentist recently to have a filling replaced. The spot was hard to reach. When the dentist’s hand, resting on the side of my face, moved for better positioning, it pulled my left eye closed. I had one eye open and one eye closed. Do you open the closed eye, or close the open eye? Our dentist is also very good at interpreting. Once, at the hair salon a woman fell asleep under a hair dryer. Several stylists tried to wake her with no success. Someone was on the phone with 911 when the woman finally woke. Not long ago, I was in rush hour traffic when a back-up began. Cars were swerving around a stalled vehicle. I swerved too, looked into the stopped car and saw the driver with his head back and his eyes closed. Another driver threw his car into park, jumped out, knocked on the car window and the man woke with a start. Maybe sitting down for more than five minutes is so rare that our eyelids automatically slam shut these days and we start to snooze. Dentists probably aren’t even aware of whether patients have their eyes open or closed, or if they have one eye open and one eye closed. All that really matters is that dentists keep their eyes open. And get a good night’s sleep before using that drill.